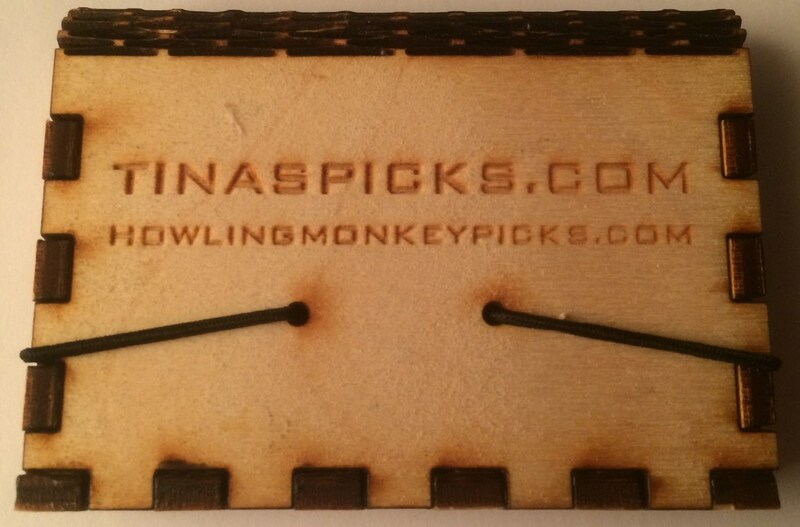 Howling Monkey picks are made from a nut found in South America called the tagua nut, considered "vegetable ivory" because it has many of the same attributes as animal ivory. Because of their ivory-like nature, tagua nuts wear down very slowly without scraping or chipping, which is why they last longer than regular plastic picks too. Most importantly, tagua nut guitar picks produce a clear, vibrant, and warm tone, illuminating the sound of the instrument not the pick. Each pick is truly origianl because the grain structure is different in each and every one of them. They take great care making the tagua nut picks, shaping and cutting them to the desired dimensions. 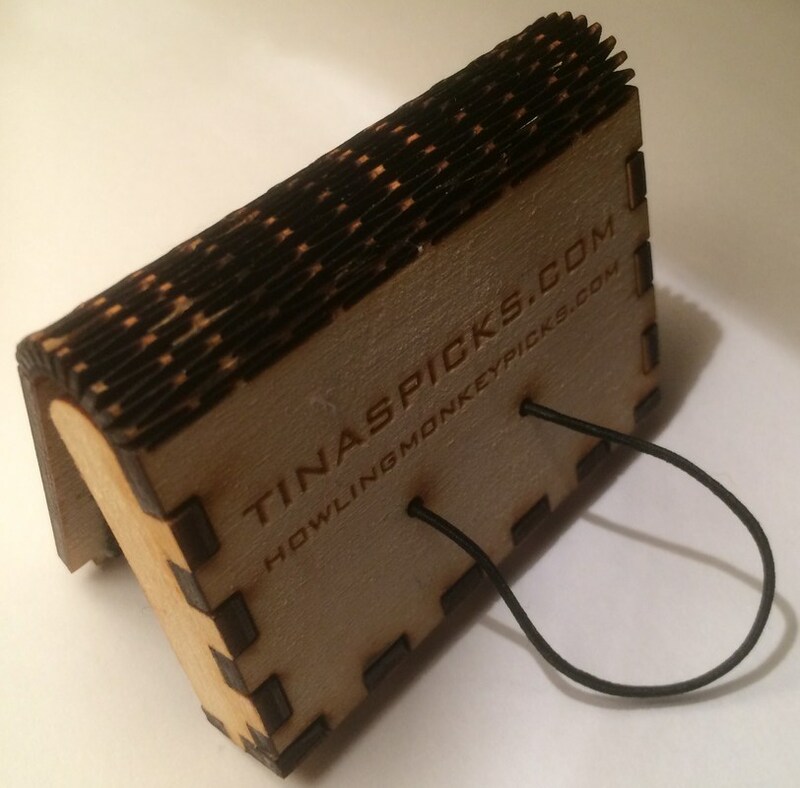 They can even make custom picks with specific dimensions or thicknesses to almost any specification. 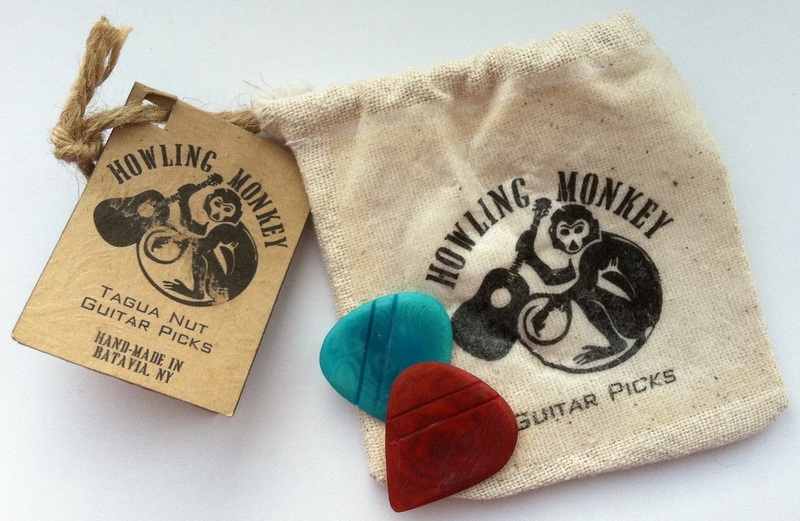 While Howling Monkey aren't the first company to make guitar picks from Tagua Nut, they feel they have created the perfect Tagua Nut guitar pick! The two grooves cut in the pick give players control without slipping, the beveled edges give great attack, and the material itself wears down slowly without chipping or scraping. Tagua Nut is a natural, environmentally sustainable substance found in South America (Ecuador). The tagua nuts are harvested through a coalition employing over 1800 native Ecuadorians providing good income that would normally not be there without this import. Unlike wood guitar picks that require manufactures to harvest entire trees, tagua nut picks are environmentally friendly - they jusy pick the fruit. And since tagua nuts grow on trees, there's no need to harm animals like horn, bone and hoof guitar pick procucers may do. Tagua is so much like ivory that most fake ivory is actually made of Tagua. It is used in museums and historical reproductions instead of elephant ivory. In the past it was widely used to make things such as buttons, chess pieces, dominoes etc. In fact, in the 1920's 20% of US buttons produced were made of Tagua! The nuts themselves are about one to two inches in diameter and are made with pure cellulose. When the nuts are first picked, they are in the form of a drinkable liquid, that turns to gel as it dries out and then eventually hardens like rock. Howling Monkey have really taken off since I got the picks above. I received a lovely package from them with their new branding, different shapes and amazingly cute box!!!!! This is such an aesthetically great shape! Click on the banner below to go to their Etsy store to buy some!